The Presbytery of derry and Strabane. Service of Installation of The Rev. Maynard Cathcart, M.A. 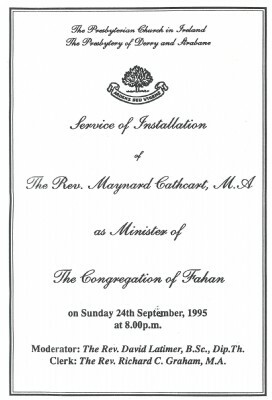 as minister of the congregation of Fahan on Sunday 24th September, 1995 at 8.00 p.m.
Moderator: The Rev. David Latimer, B.Sc., Dip. Th. Clerk: The Rev. Richard C. Graham, M.A.